New Day NW was one of my first live TV appearances back when I was only 11, and I have had the honor of returning several times over the past few years. 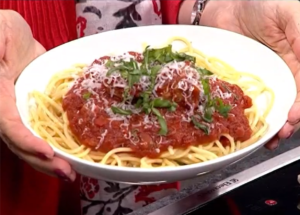 It was fun to appear on the show again to share my spaghetti and meatballs recipe. I was on the show to celebrate the release of Lady and the Tramp on Walt Disney’s Signature Collection. 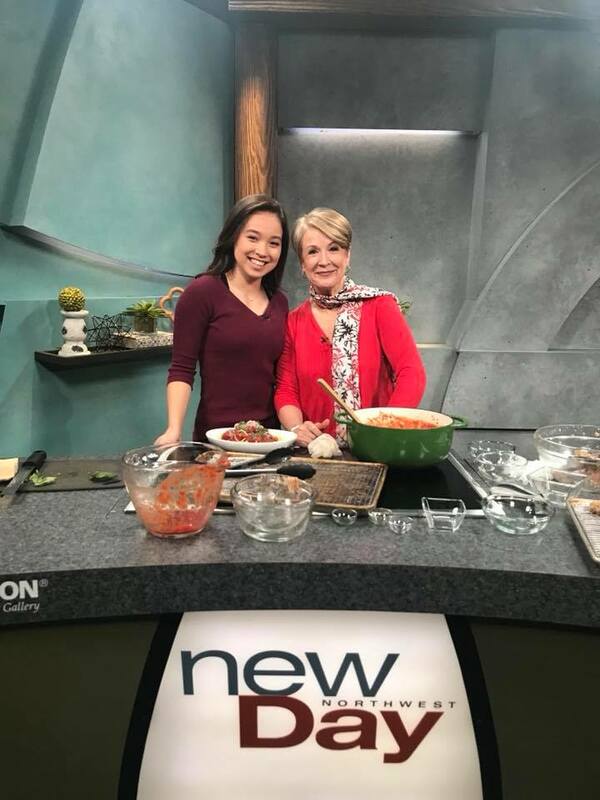 Margaret Larson is always a blast to work with and I loved sharing my recipe. There were a few funny “spaghetti-slurping” moments, but we didn’t quite live up to the famous spaghetti scene from Lady and the Tramp! Spaghetti and Meatballs for Disney's Lady and the Tramp! Disney invited me to film a bonus feature for the Walt Disney Signature Collection release of Lady and the Tramp! I put my own spin on the iconic spaghetti and meatballs from the movie. My meatball recipe has a healthy twist by using chicken sausage for the meatballs, and I baked the meatballs instead of frying them. Delicious and wholesome - that's a win-win! To make the sauce, heat the oil and sauté onions over medium heat for 3-5 minutes, until translucent. Add the garlic and red pepper flakes and sauté for one minute more. Add the tomatoes, oregano, bay leaves, salt, and pepper. Bring to a boil, then bring heat to low, cover with a lid and simmer while we make the meatballs. Place bread pieces and grated onion (with juices) in a bowl, and let the bread soak the onion juice. Add garlic, parsley, parmesan, and egg in a bowl and combine, making sure all the bread is smashed to a paste and incorporated. To the onion mixture, add ground beef and chicken sausage and combine lightly, using your hands or a fork. Overworking your meat will make it tough. Using your hands or a cookie scoop, lightly form the mixture into 1.5-2-inch meatballs and place them on a baking rack placed on top of a baking sheet. Make sure there is space between the meatballs so air can circulate. Place the meatballs on an oven rack near the top of your oven, and broil the meatballs for about 8-10 minutes, until it is brown and has some crispy edges. Turn the meatballs, and broil the other side, about 5 more minutes. Remove the bay leaves from the tomato sauce, and place the meatballs in the sauce. Continue to simmer the meatballs in tomato sauce in the covered pot for another half hour or more. Season with salt and pepper if needed. You can choose to make regular pasta or zucchini noodles. For pasta, boil 4 quarts of water with 1 tablespoon of salt. Boil the pasta el dente, according to package instructions. Reserve some of the pasta water for stirring into the tomato sauce, if you’d prefer a thinner sauce. If you prefer zucchini noodles, create the noodles by using a spiralizer, or slicing thin with a mandolin and then cutting into thin strips using a knife. Heat the oil in a pan, sauté the zucchini noodles for 1-2 minutes to soften it a bit. Season with salt and pepper. 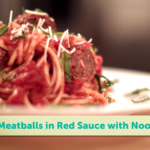 Toss the noodles with pasta sauce, top with meatballs, and sprinkle with basil and parmesan. Serve with a crunchy green salad.